Why Chart Securities Price Trends? Most trading charts show that, in some time frame, securities prices tend to move in trends, and trends often persist for long periods of time. A trend is a discernible directional bias in the price — upwards, downwards, or sideways. If you can’t see a trend, widen the time frame from a few days to many months or narrow the time frame from a few days to on an hourly basis. Create capital: As a general rule, buy securities only when their prices are rising, called an uptrend. Buying into an uptrend usually improves the probability of making money, providing you can figure out at what price point to sell. Preserve capital: You tend to make fewer mistakes and preserve capital by not buying a security when the price is falling (a downtrend) — no matter how charming the salesman or fascinating the story. In addition, you preserve capital by selling your security when it starts downtrending. You don’t know where or when a downtrend might end. Securities prices are the product of the collective decision making of buyers and sellers. Prices incorporate (or discount) all known information, including assumptions, about the security, and prices change as new information becomes available. All known information consists of hundreds of factors ranging from accurate facts to opinions, guesses, and emotions — and previous prices. Prices on a chart don’t tell you anything about the underlying value of the security. Where the price “should” be is a totally different subject, named fundamental analysis. Most technical traders use both forms of analysis because technical analysis isn’t antithetical to fundamental analysis. You can choose to trade only the highest-quality securities on a fundamental basis, but time your purchases and sales according to technical criteria. Securities prices move in trends much of the time. Trends can be identified with patterns that you see repeatedly, and with support and resistance trendlines. Primary trends (lasting months or years) are punctuated by secondary movements (lasting weeks or months) in the opposite direction of the primary trend. 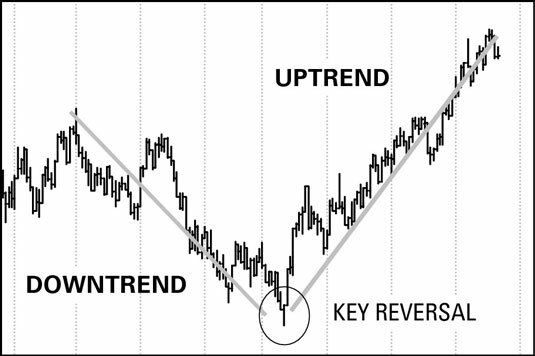 Secondary trends, today called retracements, are the very devil to deal with as a trader. Trends remain in place until some major event comes along to stop them. Prices and trends rule, so you have to be able to track and identify them. And to identify prices and trends, you have to see them. After you become proficient, you can order your software to “see” trends, but if you are a beginner, you need to become familiar with the price chart. This chart shows a classic uptrend following a downtrend. At the most basic level, your goal as a technical trader is to shun the security shown on the chart while it’s downtrending and to identify the reversal point — the best place to buy (shown in the circle) — as early as possible. Technical analysts have developed numerous indicators based on price and volume that can be expressed as statistics, tables of numbers, and other formats, but the core method remains a graphic display of prices in a chart.